So I hope you have a jar of housemade preserved lemons in your refrigerator right now just waiting to be used. If you’re a salt-fiend like me, maybe you even tasted it to sample the wonderful tangy lemon brine. Well, I’ve teased to the roasted chicken and now here it is. Adapted from the NYT, this recipe is my go-to for roasted chicken. The preserved lemons are stuffed under the chicken breast, inside the cavity and placed in-between the legs and wings creating a super moist, flavorful bird. I made it several times this year pairing it with roasted veggies and using the leftovers in a salad tossed with farro and more of the preserved lemon brine. Unlike the NYT recipe which calls for only using the lemon rind, I squeeze the pulp onto the skin, inside for added flavor. The rind is soft and edible; just remember to discard the seeds. Also differentiating from the NYT recipe is subbing honey with maple syrup, mostly because I didn’t have any honey on hand but it works just the same creating a crackly semi-sweet skin that browns wonderfully in the oven. Just don’t skip the last step reducing the juices into a gravy — it makes an lusciously sweet-tangy gravy to pour onto the chicken. I tweaked the way I used the preserved lemons every time I’ve made it from inserting whole wedges of lemon into the under the skin for a hilariously stuffed breast look (hubba hubba) to dicing it and slicing it into slivers. Since the rind is edible, I recommend dicing it so you don’t get too much of a good thing in one bite. 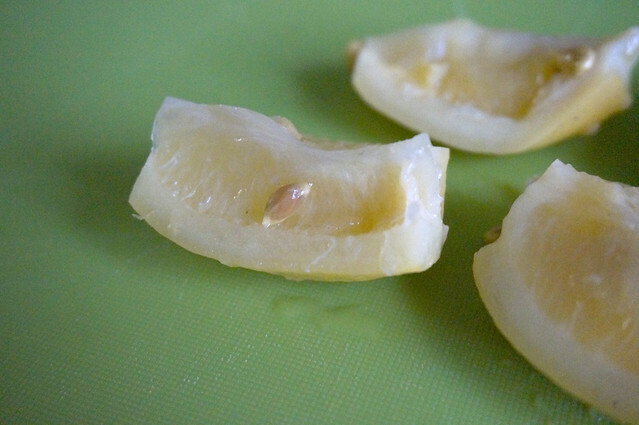 Preheat oven to 450º degrees F.
Squeeze juice from lemon wedges over chicken and inside cavity (make sure to discard seeds) until only rind is left. Using a knife, dice lemon rind. Take half of lemon and stuff half of lemon between skin and chicken breast making sure to evenly distribute lemon. (Optional: Use more lemon for a stronger citrus flavor but not more than six wedges total.) Take remaining rind and stuff half inside cavity and rest placed between legs and body and wings. Lightly season skin with salt and pepper. Set chicken on roasting rack, move chicken into oven and cook for 20 minutes. Remove chicken from oven and reduce oven to 400º degrees F.
Slather chicken with butter and maple syrup. Return to oven and roast for additional 30 to 50 minutes until thermometer inserted in thigh reads 165ºF. If chicken is browning too fast, cover with foil to prevent burning. 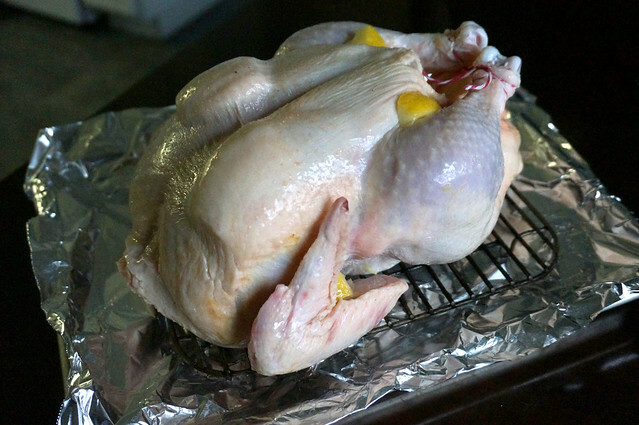 Remove chicken from oven, cover with foil and allow to rest for 15 minutes. While chicken is resting, pour juices from pan into sauce pan and reduce on stove over medium heat. 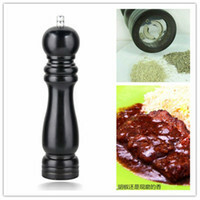 Pour and serve over carved chicken. Ohhhhhh this looks FABULOUS! I’ve never preserved lemons, but now I need to.